NCAA Pac-12 Football Recruiting: Damn, he looks good in blue! Damn, he looks good in blue! Covering the UCLA dreamers and game-changers who shape the world around us. 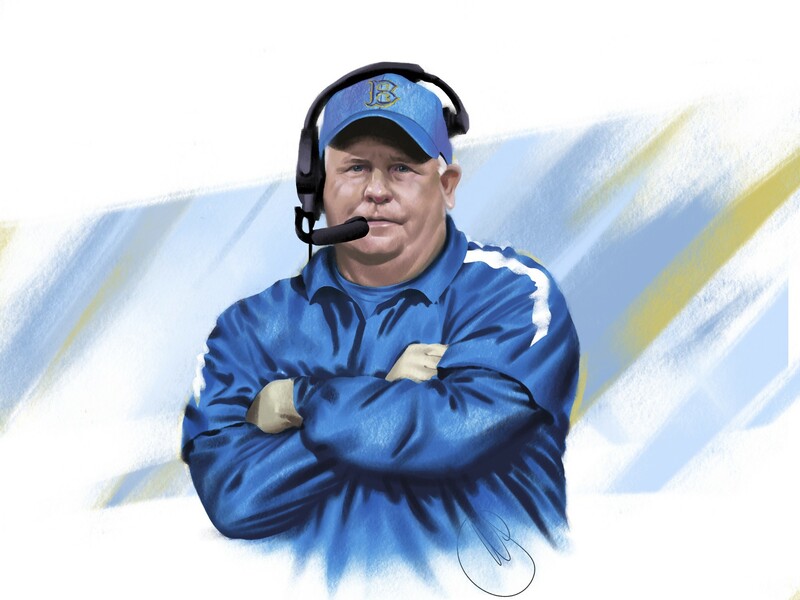 It took an All-Star team of Bruins to bring the nation’s most coveted football coaching candidate to UCLA. Speed was the defining quality of Chip Kelly’s Oregon football teams: The Ducks simply played the game faster than everyone else. UCLA’s hiring of Kelly tracked similarly?—?UCLA Athletic Director Dan Guerrero ’74 knew he must work fast to make the move amid rumors that Kelly was about to sign with the Florida Gators. Guerrero informed Coach Jim Mora that he was being let go on the Sunday following UCLA’s third straight loss to USC last fall. Then Guerrero, Chancellor Gene Block and Senior Associate Athletic Director Josh Rebholz flew to San Francisco for Pac-12 meetings. Meanwhile, Guerrero contacted Kelly’s agent, David Dunn ’83, and determined that the coach’s interest was affirmative. Arrangements were made to fly Kelly to the Bay Area for a meeting the next day. “I’ve typically not made a decision to replace a coach until after a season ends,” Guerrero says, admitting that circumstances made this time different. “The NCAA passed legislation that added an [earlier] national letter-of-intent signing date. [And] because other schools were beginning to make decisions earlier than they might normally make, I had to look at that dynamic and ascertain the most appropriate time for us to make a move. Guerrero’s decision to include Aikman ’08 and Wasserman ’96?—?two of the school’s most prominent figures?—?on the search committee proved vital. After the initial meeting in the Bay Area, the whole deal came together over a series of an estimated 50-plus phone calls between all parties. Casey Wasserman, whose family name adorns UCLA’s state-of-the-art football facility, is chairman and CEO of Wasserman. He also is the person Los Angeles Mayor Eric Garcetti tapped to lead the effort to bring the Olympics back to L.A. in 2028. According to Brandon Huffman, the national recruiting editor for CBS-affiliated 247Sports who has covered Kelly since his Oregon days, the new coach has already ignited the Bruins’ prospects on the recruiting trail. “The buzz among recruits was huge when he was hired,” says Huffman, who notes that the impact was immediate. One of the first players to sign with the Bruins after the coaching change was Chase Cota, a wide receiver and Oregon legacy. “This kid had all the makings of the next in-state player who went to play for the Ducks,” Huffman says. “But because of his growing up watching Chip Kelly’s offense, it tipped the scales to UCLA. “Clearly, we’d love to win a national championship. That’s the goal of every program,” Aikman says. “At one point in my senior year, we were ?1 in the country for two weeks. I know that this team can compete on a national level. You give yourself an opportunity to go out and play at a high level and compete for championships each and every year, and that’s not unreasonable with Chip coming in.” "